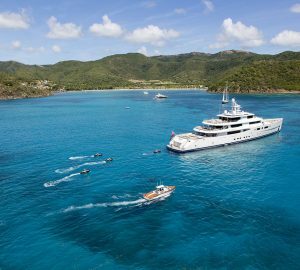 Since the early days of the luxury yachting industry the Caribbean and Bahamas have been the quintessential winter holiday destination: Empty, silky soft beaches that stretch as far as the eye can see are all within easy distance of a thriving local night scene. Shops cater to all budgets with local and international names and the friendly, laid-back local culture is infectious. Not all the Caribbean islands were hit by the devastating Category 5 hurricanes Irma and Maria; in fact the vast majority have been left untouched and those with minimal damage are determined to be back up and running before the season is in full swing. Whether you were considering visiting the Caribbean for the first time or undergoing your yearly pilgrimage to paradise, there’s no need to pack up the plans and miss out on the holiday of a lifetime – there’s more chance of discovering something unique and amazing away from the most frequently visited spots, while also helping the local tourism to thrive again. A top choice for a romantic holiday, Antigua has a great selection of crescent beaches for sunset dining and spending time walking hand-in-hand along the shoreline. Shallow, sheltered bays make the area ideal for families with young children and swimmers and snorkelers looking to gain confidence in transparent waters, while also keeping everyone in sight. Away from the coast, the island has many well-developed roads so exploring the island interior is easily achieved. Windmills dot the landscape and the caves and arches such as Hellsgate make for interesting spots for memorable holiday snaps. Home to the prestigious St. Barths Bucket, this island caters to the more lavish luxury lifestyle pursuits, with spa and massage therapies plus yoga retreats to recover from a night of indulgent dining and parties. 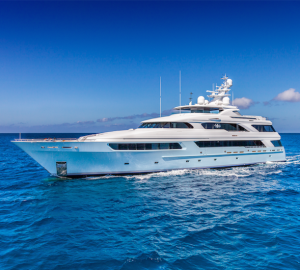 Your captain will be able to take you to the best turtle and whale-watching spots that the island has to offer, and if there’s a water toy not in your luxury yacht inventory, you’re sure to find it available to rent. Until recently, St. Vincent and the other islands of the Grenadines were a well-kept secret, hiding lush rainforest environments filled with raucous tropical birds, azure blue waters and sandy beaches. Mustique is a popular choice with the rich and famous for its minimal development, keeping the local character of colourful fishing boats while half-hidden mansions can be spotted amongst the brilliant green vegetation. Between January and February Mustique draws in the crowds with its Blues Festival – a spectacle lovers of the genre should not miss. 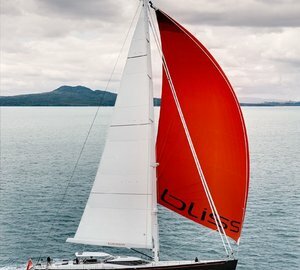 Ideal as a sailing destination from beginners through to experienced levels, charter guests can glide through the sea in style aboard a monohull or catamaran, then break out the windsurfers, kitesurfers or sailboats for a holiday engaging with nature. The volcanic spires known as the Pitons dominate the landscape and there are fumaroles and hot springs for hikers to visit on their ascent. 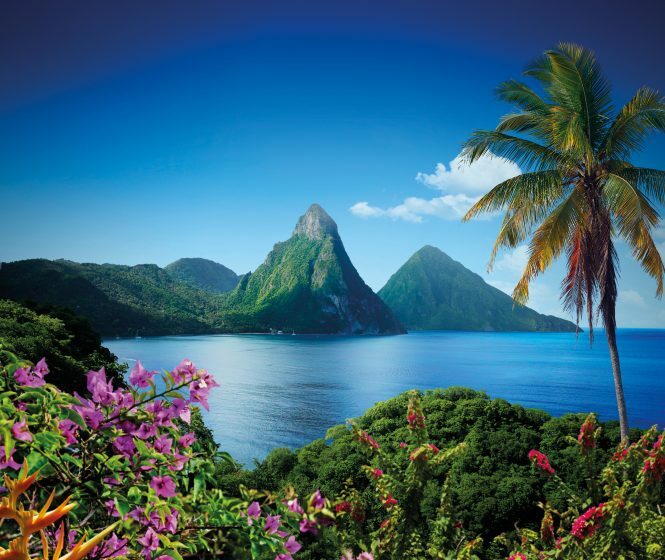 With some of the best hiking trails and bird-watching opportunities in the Caribbean, luxury charter groups have the chance to glimpse the endangered Jacquot parrot, found on St. Lucia and a strong national symbol. 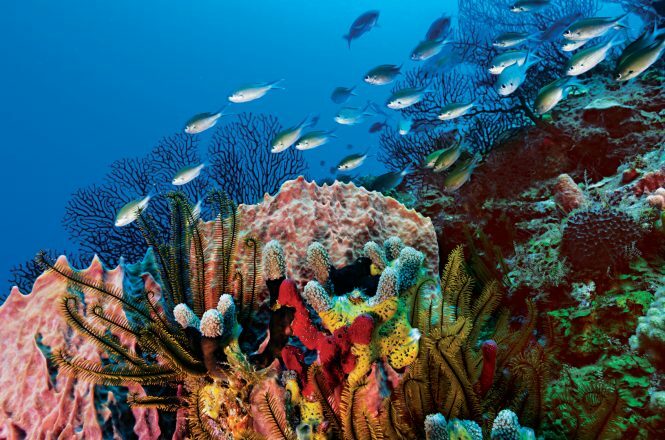 Fishing, snorkelling and diving are all well-established pastimes among the locals and visitors to the region will leave satisfied with the time they have spent at this centrally located stop within the Leeward Islands. 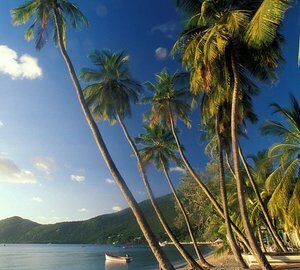 This overseas region of France is known as Madinina, the Island of Flowers, and certainly lives up to this name with the incredible array of flora that colours the coastline and mountainsides, while the interiors have plenty of plantations for fresh produce straight to your plate. The eruption of Mt. Pelee half a century ago has resulted in ruins on land and a number of shipwrecks underwater to form an historically important area perfect for exploration, both for hiking and Scuba diving. The botanical gardens are ideal for a tranquil group excursion suitable for the whole family. A small island relatively untouched by the passage of time, Bequia is a charming destination where local craft shops mingle among the coastal bars and restaurants. 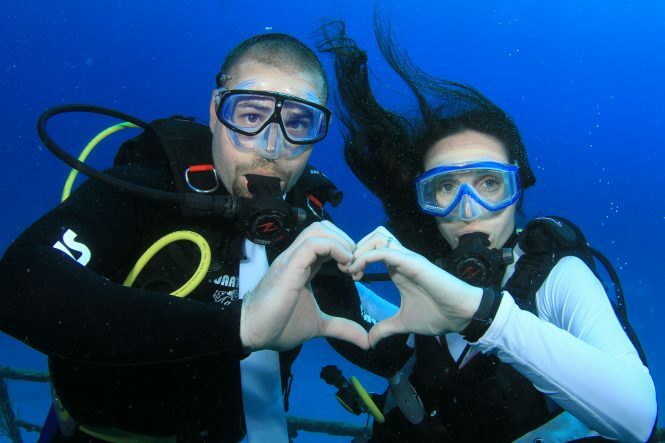 The rich diving spots of Bequia are home to whales, dolphins and manta rays for a fantastic first encounter for younger members of the group. 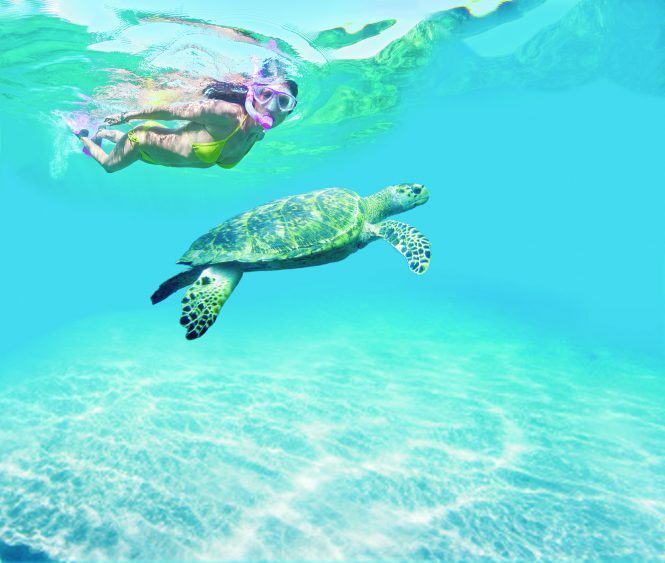 The Old Hegg Turtle Sanctuary allows guests to get up close to these magnificent sea beasts without setting a foot into the water. 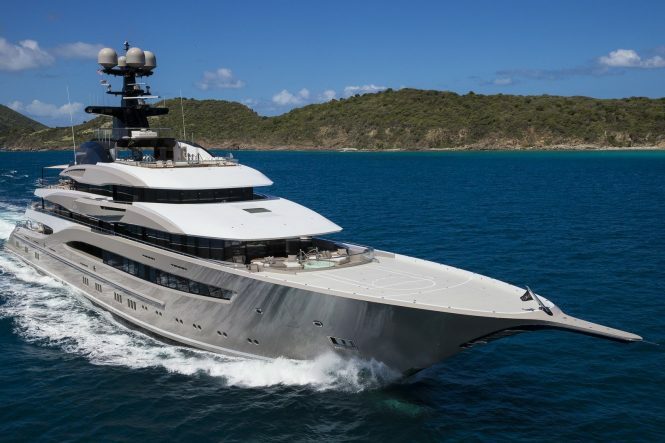 This national marine park is only accessible by superyacht charter, ensuring that the pristine natural environment is carefully monitored and never has to fear erosion from too many visitors. Dive and snorkel among the reefs where colourful sponges and sea fans are the backdrops to vibrant fish, reef sharks and manta rays. 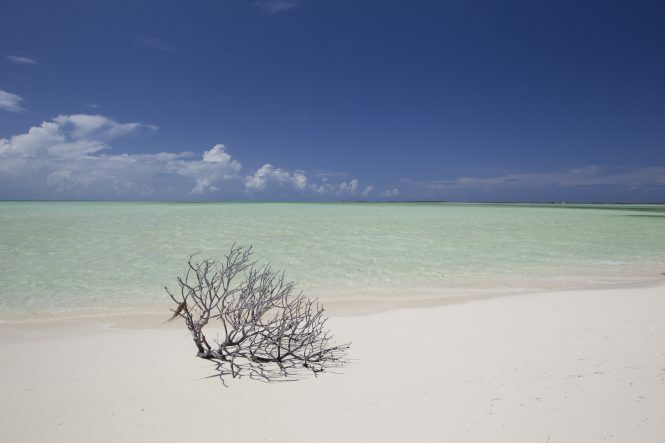 Have a desert island all to yourself, choosing between Petit Rameau, Petit Bateau, Baradol, Jamesby or Petit Tobac – the latter being a filming location for Pirates of the Caribbean: Curse of the Black Pearl. Known as the Island of Spice, Grenada is an aromatic treat of nutmeg and chocolate offering secluded spots like Secret Window Beach and the waterfalls along the mountain paths. 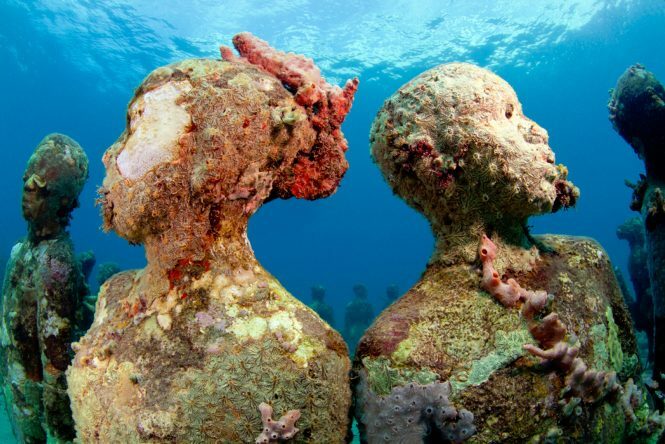 The underwater sculpture park was the world’s first, designed in 2006 and consisting of 65 statues for charter guests to explore by Scuba diving or snorkelling. National parks, museums and estates make for rich sightseeing destinations chronicling the evolving cultural identity of the island, while the Port Louis Grenada Sailing Festival takes place in January, adding a great event to a New Year itinerary. Whether you’re looking to visit alternative locations to the Caribbean or add something extra to the itinerary, the Bahamas and Bermuda are ideal choices, if a little colder than the islands to the south. Bermuda hosted the America’s Cup 2017, where many visitors discovered its charms for the first time. On the south-east coast, there are pink sand beaches that are truly stunning, while the sheltered harbour is excellent for young swimmers and playing with water toys such as kayaks. Consisting of over 700 islands and 2,400 cays, the Bahamas is a balance between high-end luxury and easy escapism. Only 45 miles from Miami, Bimini is easy to incorporate into a luxury charter along the coast of Florida. 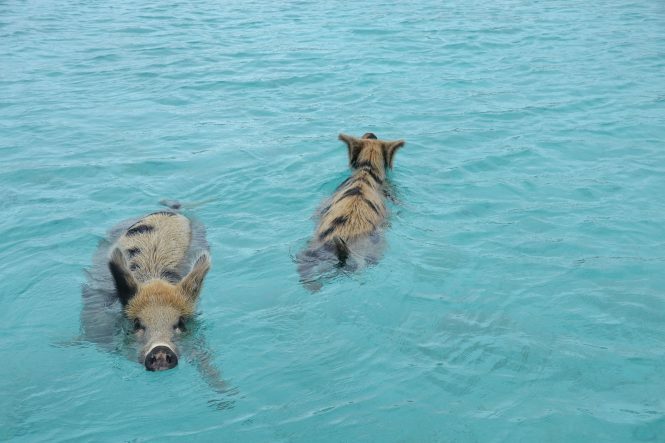 Alternatively, the Exumas are surrounded by one of the world’s great barrier reefs for thriving snorkel and diving sites. 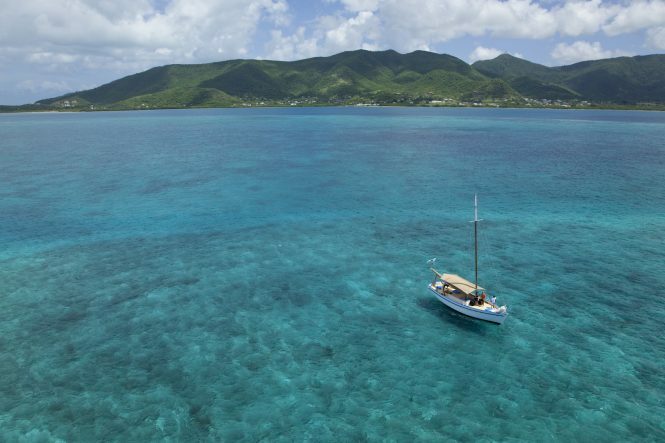 Please contact CharterWorld - the luxury yacht charter specialist - for more on superyacht news item "Top 10 Caribbean Yacht Charter Destinations to Cruise this Winter".